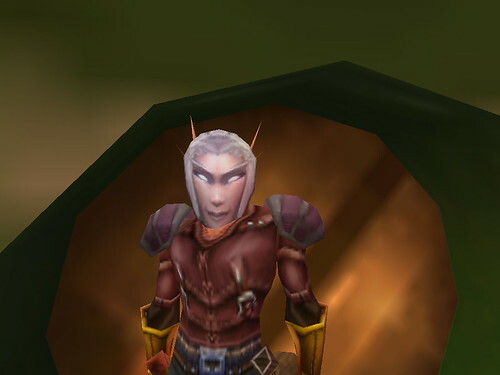 The elf masks are very creepy. The trees have started changing color and their leaves have begun dropping to earth. A chill wind blows in the evenings. 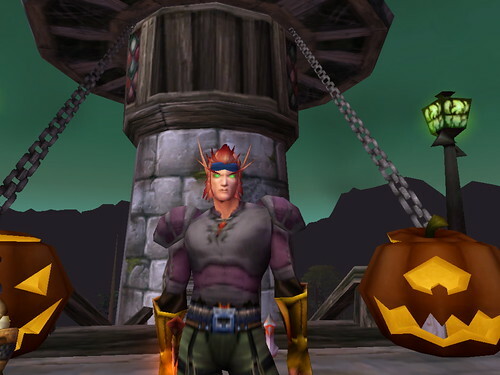 The farmers in Westfall and Arathi are finishing up their harvest seasons, whcih must mean tt’s time for Halloween in Azeroth again. 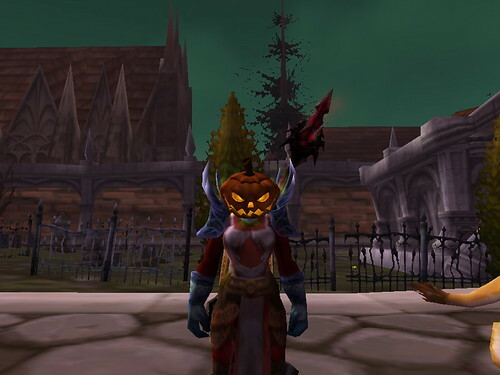 During this holiday season the Horde cities are full of adventurers running around with pumpkins on their heads trying to sell brooms. Wisps and bats, pirates and ninjas run past on all sides. The zeppelin looks like a menagerie of terror. Blind party invites are flying, and if you accept you could find yourself turned into any sort of monstrosity. Pumpkins dot the doorsteps of every house, and huge barrels of apples lay prepped for bobbing. 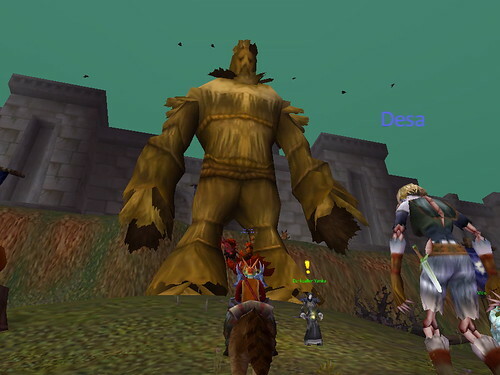 Outside Undercity stands an enormous Wicker Man–no word on if uptight policemen fill his belly–and surrounding the Wicker Man are dozens of heavily armed sellswords waiting for Alliance scum to ride by. The ground is sticky with blood. The Headless Horsemen shouts and rides across the sky, burning the towns of Brill, Razor Hill and Farstrider Square. Helpful adventurers carrying buckets run around dousing every flame as soon as possibe. The level of civic involvement would bring a tear to my eye if only they weren’t being paid so well to do it. The Scarlet Monastery has become an abbattoir. A palace of bone and ash and corpse. You cannot see the flagstones for all the skeletons of dead Alliance. This is as it should be. But Alliance should be wary and be prepared. 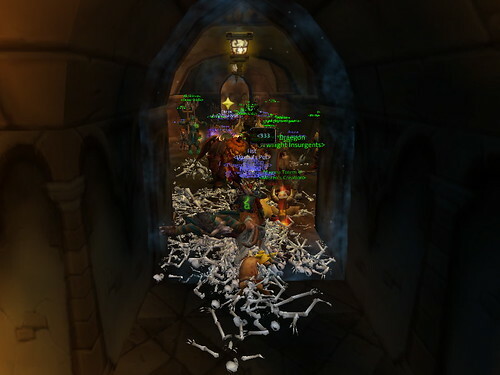 My guild–the Holy Hammer–spent all evening conjuring up the Horseman and slaughtering him over and over, making him pay for burning our innocent hamlets. I have not yet made the trip to South Shore to play my pranks, but I expect it will be not unlike running headfirst into a meat-grinder over and over again.